Vampire turned vampire hunter Sonja Blue travels the globe, hunting down and disposing of those creatures of the dark who prey upon the innocent, all the while searching for the monster that created her. But as dangerous as hunting the undead may be, it's nothing compared to the threat posed by The Other, the vampiric personality that shares her body. Can Sonja Blue vanquish her very real inner demons in time to save an innocent man from a depraved televangelist? Originally published as a mini-series by Glenn Danzig's Verotik Publications in 1995, this hardcover graphic novel from IDW Publishing collects all six issues plus a special ash-can and the short story "Aphra", which first appeared in the notorious Verotika #4 and has been digitally re-colored by artist Stan Shaw, with a re-tweaked script by author Nancy A. Collins, and completely re-lettered by Eisner & Harvey Award-winner Thomas Mauer. Available in stores November 26th, 2014. Pre-Order Now! 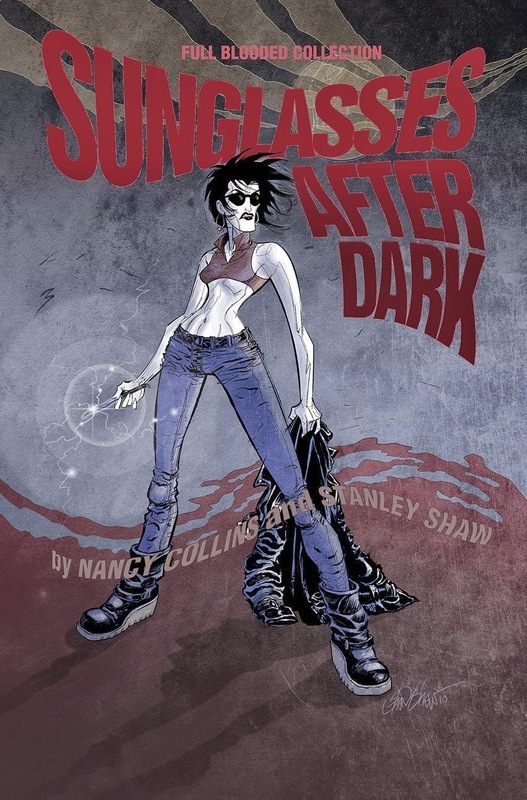 Sunglasses After Dark Now On Audiobook!